A proactive approach to banning and eliminating asbestos on ships prevents exposure and unnecessary illness and death. If built after July 2002, the vessel’s flag registry, in conjunction with its classification society, issues a non-extendable exemption certificate, providing the owner with a three-year window in which to remove the asbestos. If built prior to 2002, ships may contain asbestos but must have a hazardous materials’ register and management plan in place to cover any maintenance or repair work involving asbestos. These two opposing options create a challenge in defining across-the-board safety standards to protect anyone working on or near sailing vessels. However, consistency and uniformity can be achieved by enforcing a complete ban of asbestos on all sailing vessels. This requires that ships be assessed to ensure compliance. In the European Union alone, there are 30,000 ships requiring an IHM (Inventory of Hazardous Materials). Estimates are that 80% will contain some form of asbestos. The amount of asbestos found onboard depends on several factors, including where the ship was built. Ships can also be contaminated through items brought on board by the owners, despite assurances that they are asbestos free. Asbestos is a fibrous mineral known for its insulating and fire-retardant properties. For these reasons, asbestos was once a staple in most insulating products and many industrial and construction products. It was used in abundance at shipyards from coast to coast and on U.S. Navy ships such as those found in the Pearl Harbor Naval Shipyard. In addition to widespread use across the United States, asbestos was also used around the world, including in the Middle East. The most deadly asbestos-related conditions among naval veterans and maritime workers or family members are malignant mesothelioma and lung cancer. What Does “Asbestos Free” Really Mean? Because of varying international standards, the term “asbestos free” can be quite misleading. In the USA, for instance, it is up to a 1.0% content, while in the EU it is 0.1% and 0% in Australia. China has no official standard at all. This is a concerning issue because a lot of material and equipment originates from China where it is still legal to use asbestos (See crayons and cars). Chinese manufacturers may set up a production line to supply ”asbestos free” materials, but they could also be unaware of cross contamination in their factory emanating from other production lines that are producing items containing asbestos. Hire an accredited asbestos contractor to inspect for asbestos, or engage a qualified laboratory to test any materials you suspect may contain asbestos. If asbestos is found, have a properly trained and accredited asbestos contractor or accredited company remove the contaminated materials. Once your vessel is determined to be asbestos-free, initiate a quality management system that tests materials supplied to the ship to ensure that they are safe. Thirty percent of those diagnosed with mesothelioma annually are military veterans. Asbestos exposure is the only known cause of mesothelioma. 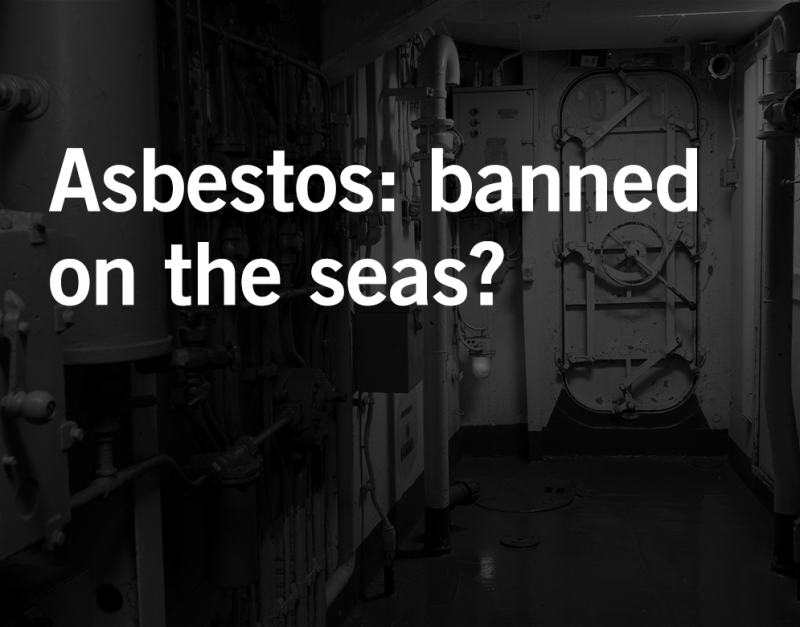 Asbestos-containing materials were used extensively in U.S. Navy shipyards and military bases. Veterans with a history of long-term or intensive navy asbestos exposure are particularly susceptible to this life-threatening cancer. When asbestos dust is inhaled into the lungs, it starts a chain of events within the body that can lead to the development of mesothelioma over time. Using our extensive resources, our asbestos lawyers have helped victims of asbestos exposure that occurred here in the U.S., including Hawaii and Alaska, as well as those who were exposed abroad. With a national presence and a wealth of experience prosecuting mesothelioma cases, Waters Kraus & Paul provides aggressive representation throughout the entire course of litigation. To learn more about legal representation at Waters Kraus & Paul, or to have one of our asbestos attorneys review your potential mesothelioma or other asbestos-related illness case, email us or call 800.226.9880.